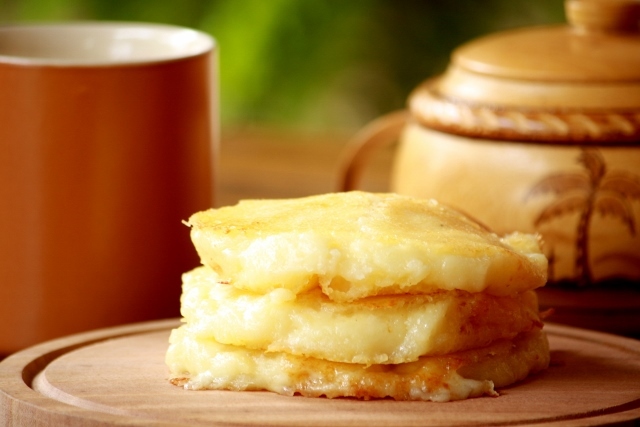 Sonso is a cheesy Bolivian pancake made with yuca or cassava. Sonso is enjoyed with a cup of coffee in many Bolivian houses. Sonso (which means foolish in Spanish) is a dish from the east of Bolivia where yuca or cassava abounds. There are 3 varieties of sonso, fried, baked or grilled. 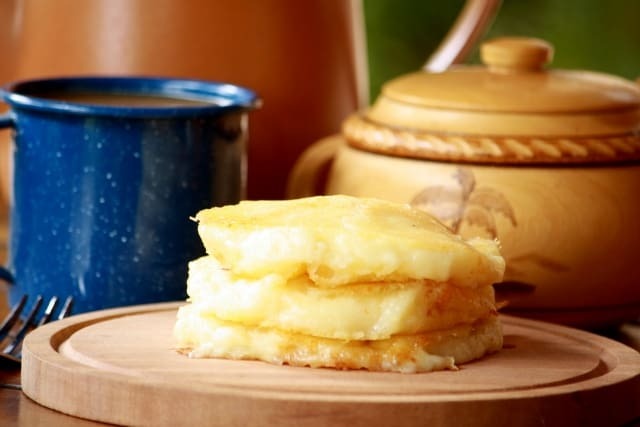 Whichever you choose to make, its main ingredients are cassava and cheese. Very simple and very delicious. Cassava is a root with a thick brown skin. Peel cassava with a knife and then boil the white part with plenty of water. The cooking time depends a lot on the kind of cassava you are using. Paraguayan cassava takes much longer than the Bolivian cassava. 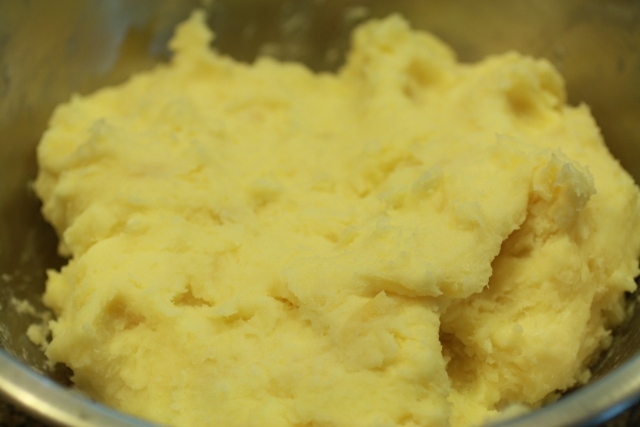 Once it is soft, remove and mash it with a fork to get a puree. You can double this recipe and freeze the rest of the dough. As I mentioned, Paraguayan cassava is firm/hard, which makes it difficult to mash. This is what I have done for several years: I boil some cassava for 20 minutes, and once cool I freeze it. When I need to use it, I take it out of the freezer and boil it again for another 20 minutes. 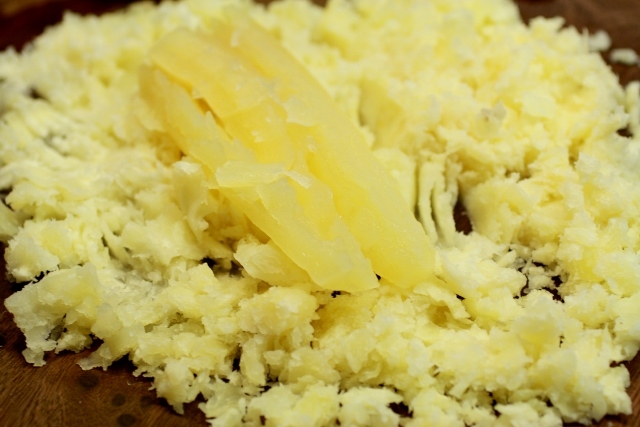 After the second time cooking, the cassava gets really soft and so much easier for mashing. What kind of cheese should I use for Bolivian sonso? Bolivian cheese is a hard and very salty cheese. In Paraguay, I’ve used mozzarella, Holland cheese, and Paraguay cheese. Use your favorite hard cheese and adjust the amount of salt according to it. Once you have your cassava puree ready, these pancakes come together pretty quick. 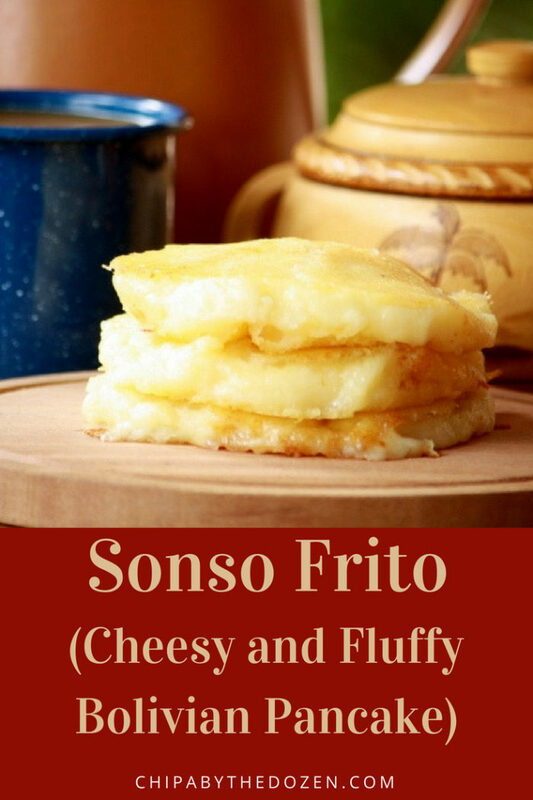 This sonso de yuca frito is served with a hot cup of coffee for breakfast or afternoon snack. But it’s a delicious side dish that goes really well with pork. In a large bowl mix all the ingredients. Taste for salt. Divide the dough into 6 equal portions, form a 1.5 cm thick disk (1 inch). Heat the pan on low, add butter or oil. Fry each sonso for one minute each side. Serve hot. You can double this recipe and freeze it. 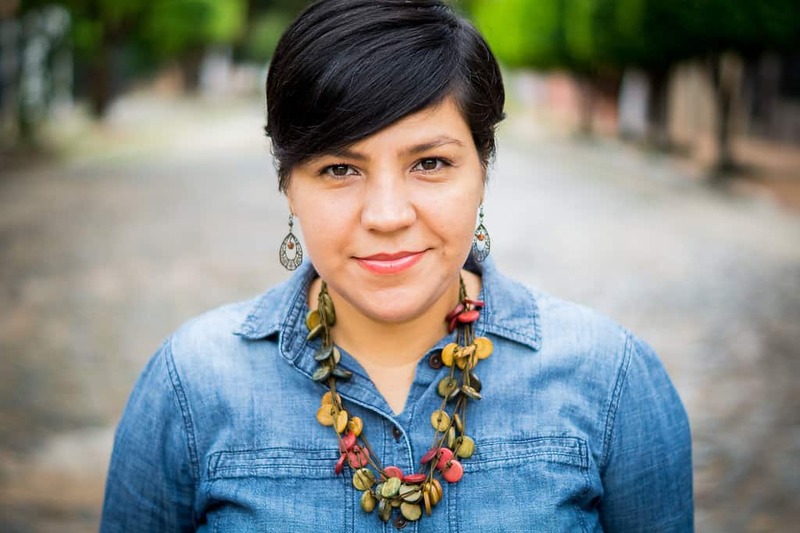 Hola Lizet, me causa gracia el nombre de tu preparación… acá sonso es una persona tonta… jijijij. 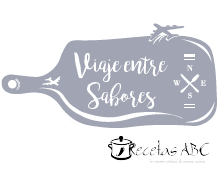 Me encanta la idea de utilizarla como guarnición y también de conservarla en el congelador ya cocida… por lo general congelo la yuca cruda, pelada y picada, de manera de cocinarla a demanda. Tengo dudas con relación al queso, el queso seco es un queso que no contiene grasa o es un queso que ha sido madurado? Gracias Lizet, me gusto mucho este plato de tu tierra! Ninoska, muchas gracias por pasar! la verdad que en Bolivia tiene ese significado también. No tengo idea por qué se le llama así. Pero el nombre es muy simpático. Sí, el queso seco sería un queso maduro. Tu blog está para chuparse los dedos!